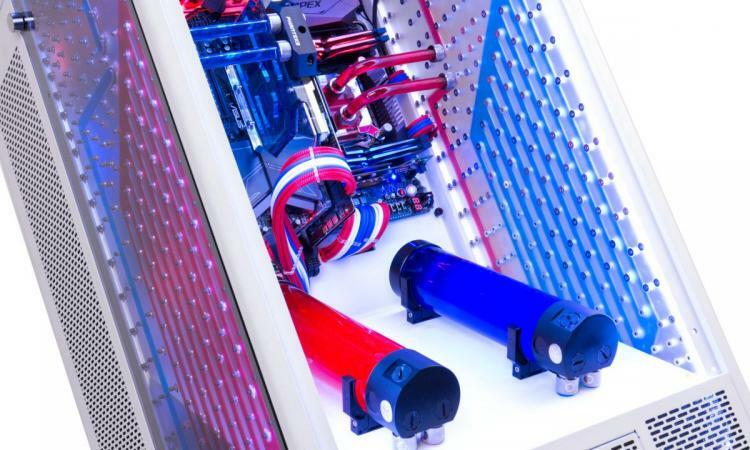 OverclockersUK is proud to announce it's new range of INFIN8 systems, designed in house by our expert team and inspired by the legendary 8Pack range they're the finest bespoke systems we have to offer. With custom acrylic pass through plates, dual loop hard pipe water cooling and built inside the most premium cases you know there's nothing else like it on the market. 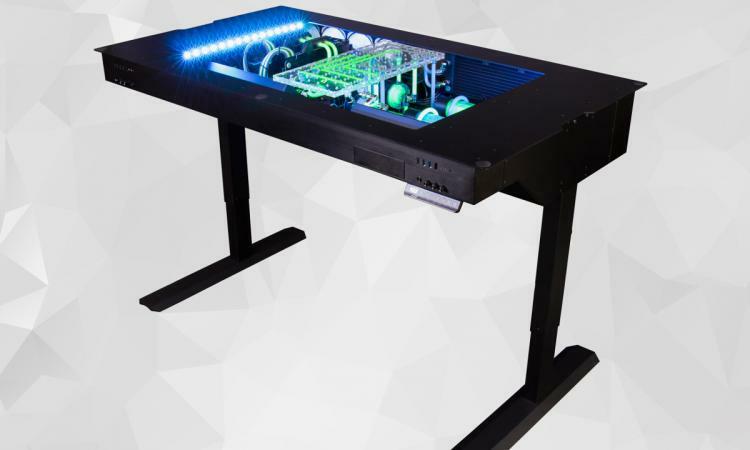 The Infin8 Altar system is crafted in a Lian Li DK-05X motorised, height adjustable, aluminium construction desk chassis topped by a slab of tempered glass. 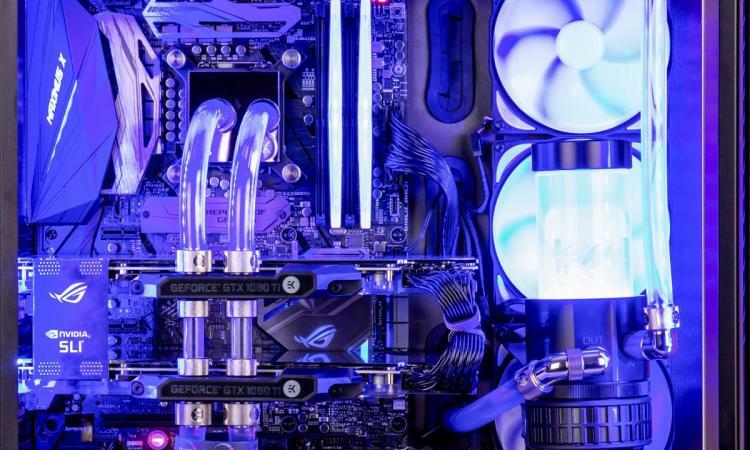 It houses two beautifully crafted and intricate custom water cooling loops featuring hand made acrylic pass-through plates, hand-braided PSU cables and LED lighting, which combine to create the most incredible PC. In terms of specification, the Altar comes with a 8-Pack approved 4.6GHz i9 7900X along with a pair of water-cooled Nvidia GeForce GTX 1080Ti 11GB graphics cards configured in SLI. The Altar is built on the back of three triple-layer acrylic plates, each placed separately around the system to feed it’s two water cooling loops. The first is a custom base-plate located beneath two 400ml EK reservoirs. Coolant is fed from each reservoir, through the acrylic plate, and back out into hard piping looped over the opposite reservoir. Just for show. The second custom plate, known as the manifold plate, is suspended just below the case’s tempered glass. This provides access to three triple (360mm) radiators, two for the GPUs and one for the CPU. 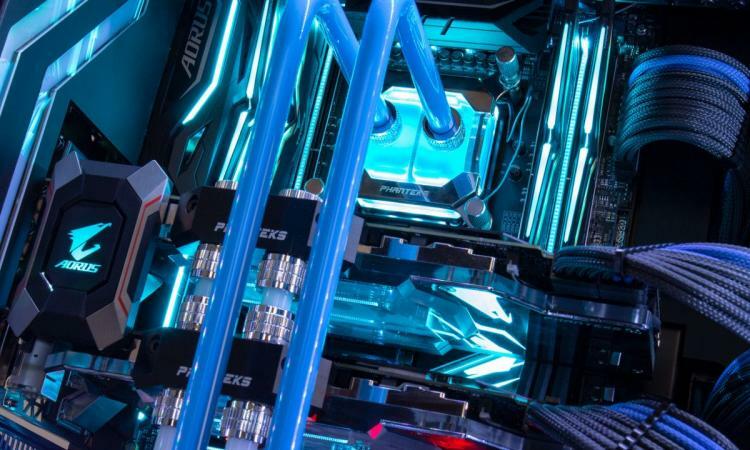 The Altar’s third and final custom plate - known as the component plate - is located just beneath the visible pumps, feeding the custom loop for both the GPU and CPU. 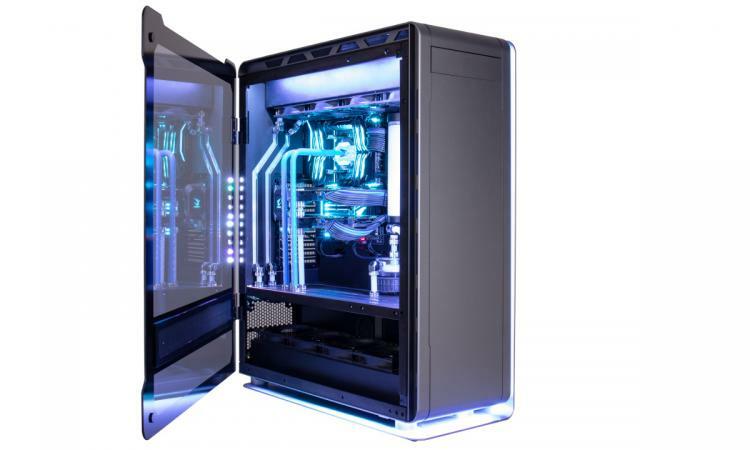 "The Infin8 Hunter system has been a long time in development, taking our water-cooling game to the next level by sinking its dual loop into four individually designed and laser cut layers of acrylic plating to create one of our most iconic designs." The Phanteks Enthoo Elite case opens up to allow access to the Infin8 Hunter’s specially overclocked Intel i7-7820X. The CPU is overclocked to a minumum of 4.6GHz and complemented by two GTX 1080Ti for unparalleled gaming performance. At the heart of the Hunter’s water cooling system lies two custom made four-layer acrylic passthrough plates, each with its signature black design inlaid with clear acrylic to display the integrated channelling. Individual layers are laser cut and assembled utilizing a secret technique which eliminated the reliance on industry standard o-rings. 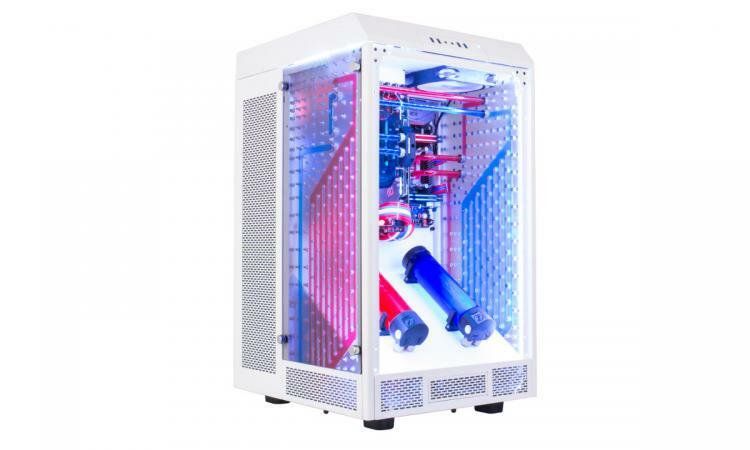 The Hunter also features a custom acrylic backplate alongside a redesigned motherboard tray, mounted to which are two 250ml EK reservoirs complete with matching EK revo pumps. The first of the acrylic passthrough plate cools the Phanteks CPU and GPU blocks via two quad radiators, with the dedicated CPU quad radiator located in the lower compartment of the case. The second vertical plate is located along the rear IO of the chassis enabling fluid to travel all the way to the quad EK 480 radiator mounted at the top of the case, dedicated to cooling the Hunter’s dual 1080TI’s. 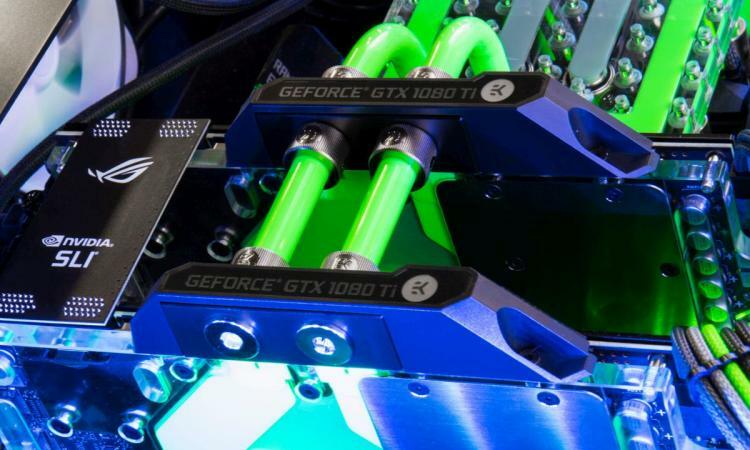 "The Empress system is one of the most popular Infin8 PCs we offer, but unfortunately the Empress did not have the watercooling headroom that would allow us to comfortably offer dual 1080TIs. Therefore, the Monarch was born. Designed to mirror the Empress' impressive look, but in an even greater chassis." 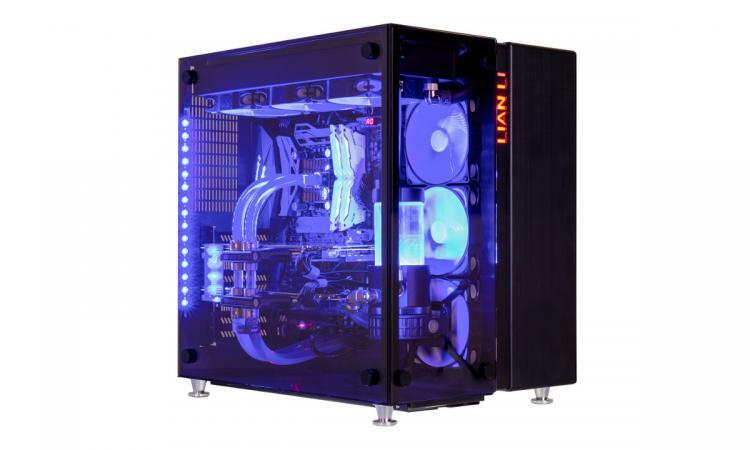 The Infin8 Monarch system is designed with the Lian Li PC-O9 Aluminium & Glass Cube Case as a foundation, armed with either a Ten Core Intel Core i9 7900X overclocked to a minimum of 4.7GHz or Six Core Intel Core i7 8700K overclocked to a whopping 5.1GHz! Monarch's thermal management utilizes an intricate Custom Watercooling Loop featuring Mayhems fluid, cooling a pair of Nvidia GeForce GTX 1080Ti 11GB graphics cards that are configured in SLI. Storage is handled by both an SSD & HDD. A Samsung 960 EVO NVMe Solid State Drive is selected as the primary drive, enabled for unparalleled date transfer speeds and configured for split second application and game load times. This is backed up by a large mechanical hard drive offering ample space for literally everything else. "As soon as we saw the Thermaltake Tower 900 we wanted to do something crazy with it. We were just getting into creating our own custom acrylic parts at the time and we had the idea to create a cleaner internal structure by moving the passthrough plates against the window of the case. The design of the system is intended to showcase two contrasting fluid colours in overlapping loops." The Infin8 Obelisk system is a gaming machine with one of the most intricate pass through plates we’ve ever designed, featuring 223 screws securing 10 individual fluid channels - per side. Housed in its ThermalTake 900 Super Tower, It features hand braided cables to match the dual watercooling loop regulating it’s 8-Pack approved 5.1GHz Intel Core i7-8700K and two 11GB GTX 1080Ti. Taking its cues from the Monarch, Obelisk's storage is handled by both a SSD & HDD. A lightning-quick 500GB Samsung 960 EVO NVMe Solid State Drive is selected as the primary drive, while a large 2TB mechanical hard drive offers ample space for applications and data not quite so speed-sensitive. The four new Infin8 series designs join seven other custom-built base system designs, each of which bring their own flavour (as well as premium components and water cooling) to the series. You can find them all at https://www.overclockers.co.uk/pc-systems/prestige-pc/infin8, built to order exclusively from OverclockersUK.